If you don't know what Crypsis is, feel free to read this. Short story is: Crypsis is the company that I (Connor) have started, which will eventually serve as a complete camouflage solution for paintballers, airsofters, hunters and everyone else spending their weekends hiding in the bush. I've tried to remain optimistic about the strike up to this point, but it looks like it's here to stay, at least for a couple weeks. 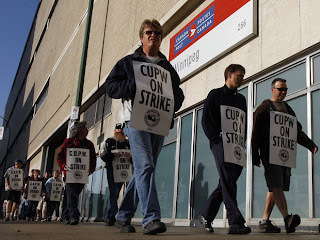 Rotating strikes won't cripple Canada Post, but a full strike would. As it is not only the cheapest but also a duty free option for American customers, it was my first choice for a shipping provider. For now it will remain as such, but that may need to be re-evaluated. I've decided that I won't let it ruin my month, and the Crypsis site will hopefully go live very soon (barring any unforeseen setbacks). SURPAT is looking to be a lot more expensive to carry than originally thought. If you're 100% sure that you want SURPAT, send me an email here and let me know how much you'd be willing to pay for a full BDU set (please bear in mind that it's coming from Russia). Meet Crypsis' official mascot! Named after Boston Corbett (you'll figure it out if you google him). Some of you may have heard of the very cool Taco retention system, but did you know it works for T68/Milsig magazines like a dream? If enough people are interested, I'll talk to the guys at HSGI and see if they'd like to supply Crypsis. I'll also try to do some kind of review of the pouch soonish.